Earlier today, at a press conference in San Fransisco, Mark Zuckerberg and his team announced the latest big feature on offer from Facebook, a new messaging service that integrates with email. Facebook users will be able exchange messages with people who are not on Facebook with an @facebook.com email address which comes directly to their Facebook inbox, but this is not intended to simply be a new email platform. 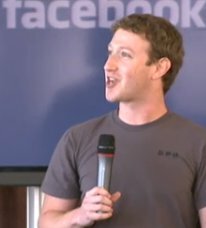 Mark Zuckerberg started by referring to a conversation he had had with some high school students in which he was told that email is too slow, on questioning this and thinking more about why they felt this to be the case he decided that it was the process of writing the email address, the subject and the usual formalities of a letter that made email feel slow compared to other messaging systems, such as SMS text messaging and Facebook. Currently about 350 million people use the messaging features of Facebook, sending over 4 billion messages to each other each day. In allowing Facebook users to integrate their communication with non-Facebook users by using email, they wanted a seamless messaging service that converges messaging between SMS, email and Instant messaging. The new system will not be based upon subject lines, rather each group or person will have one conversation history, similar to Instant Messaging. Facebook’s new system combats email overload with a “social inbox”, the settings for which allow users to choose which messages come through to it in typical Facebook style, allow messages from friends, or friends of friends etc – adding specific senders to the filters where they are not on Facebook. Meanwhile other messages all go through to a separate inbox that can be checked as desired. The plan is that contacts can easily be moved between the social inbox and the “other” folder. A separate spam folder is also to be offered. Facebook will also allow users to choose settings that will simply allow or disallow senders from messaging them at all. As for the email address itself, on June 13th Facebook made it possible for their users to choose a username on the system that would be used as part of the profile address, my profile address for example is http://www.facebook.com/james.herbert. Now, once activated (the service is optional), this same username can used as part of a standard email address, giving me james.herbert@facebook.com. A degree of email integration was quietly launched a short while back with the new improved Facebook Groups feature, allowing group administrators to choose an @groups.facebook.com address with which they could post content directly to the groups wall by email. The announcement stated that the new service will start to be rolled out slowly as of today using an invite system, it is expected to take a few months to roll out completely across Facebook.